Beautiful poppy illustrations grace these letterpress wedding invitations, inspiring thoughts of the couple's growth and new life together in the months and years ahead. 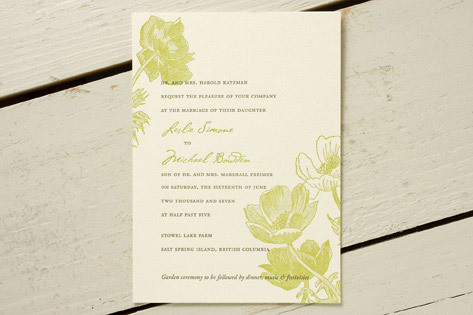 The wedding invitation suite is printed on Crane Lettra paper in ecru and features optional decorative paper, pockets, and ribons. Available in leaf/charcoal (shown), leaf/tangerine, spring/begonia, and persimmon. Fonts shown are Garamond and Cezanne.